Serious training can still be fun. Teaching college students in New York City. A modern martial art must address modern problems. Guns are a modern problem. Therefore we must address the topic of gun defense. We apply the concepts of jujitsu; knowledge of the body, and knowledge of the weapon, together with some Israeli attitude, to create an effective defense against handgun threats. Of course nothing in life is 100% and we only would apply these techniques if we were convinced the person is about to shoot us. Teaching gun defense seminar, Springfield Illinois, with Chief Defensive Tactics Instructor, Police force. One of the differences between jujitsu and Krav Maga, as applied to gun disarms, is that instead of using only the wrist we use the entire torso, which is much more powerful. For example, with a gun pointed to the side of our head or chest, we pull him forward, causing him to lose balance, then, instead of a traditional wrist lock, we use the powerful torso muscles to enable us to bend the wrist of even a much more powerful opponent. 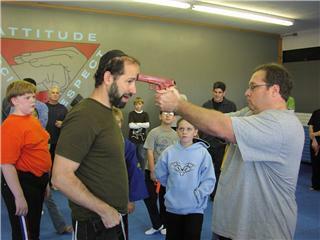 All Krav Maga gun techniques follow several basic principles. 1. Redirect the line of fire and get out of the line of fire. 2. Control the weapon and the weapon hand. 3. Off balance the assailant. keep movements short and tight, point gun towards the ground. Whenever possible, these principles overlap. For instance, controlling the weapon and counterattacking often take place at the same time. But whether they are initiated simultaneously or separately, these principles must be understood and addressed for a gun defense to succeed. Come to the Krav Maga training center and learn how. Sometimes people worry that if they grab a gun to do a disarm they might burn their hand. This is not the case. How do guns and knives match up? If you carry a fire arm, if you are an armed defender, we have some useful tips for you. Click Armed and Dangerous. Some examples of Krav Maga gun disarms were displayed and explained on Fight Quest and The Human Weapon; Krav Maga episode. Gun Defense - Angle of Defense .